Do you want to be able to send targeted emails to MailChimp segments? Being able to send your email campaigns to subscribers based on their behavior makes your email marketing efforts more effective. In this article, we’ll show you how to create a segment MailChimp mailing lists so you can send the right information to the right subscribers every time. When it comes to MailChimp groups and segments, there is a lot of confusion. That’s why we’re going to clear that up for you, before showing you how to segment your MailChimp lists. A group in MailChimp is an easy way of assigning subscribers to a simple category within one single MailChimp list. For instance, in our tutorial showing you how to give subscribers a way to select a MailChimp group, we divided users into two groups: Interest 1 and Interest 2. Other examples of groups include age groups, gender, or nearby cities. All it takes a subscriber to be assigned to a group in your MailChimp mailing list is the satisfaction of one condition, which in our example was being a part of Interest 1 or Interest 2. 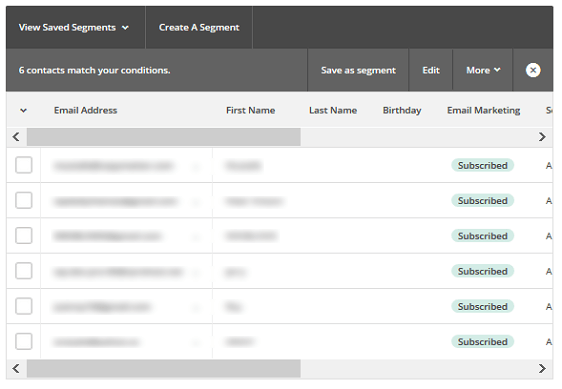 MailChimp segments are a way to divide your subscribers into very specific categories based on multiple conditions, many of them related to how your users behave. For instance, you might want to target those who have subscribed after a certain date or number of days, subscribers who live in a certain location, or subscribers that have spent more than $100 in your eCommerce store. You can take it even further and filter your segments using some of the five conditions available. For example, you may want to create a segment that is meant only for subscribers that are female, are ages 25-35, and have spent more than $100 in your online shop. The only way for a subscriber to be assigned to a segment in your MailChimp mailing list is to satisfy all of the conditions you define. In the end, it is easiest to think of groups as a way to find out who your audience is, and segments are a way to find out how your audience behaves so you can personalize your email campaigns. 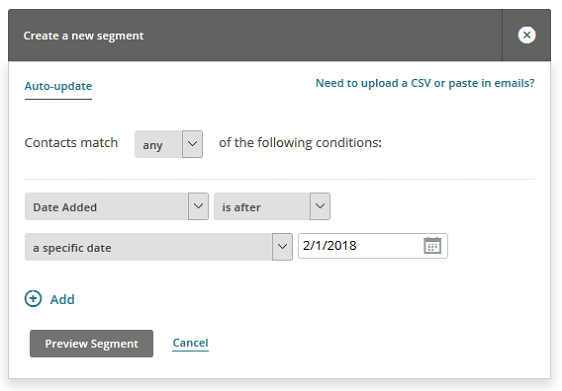 Now, let’s take a look at how to segment your existing MailChimp lists for sending out targeted email campaigns to specific subscribers. The first thing you’ll need to do is install and activate the WPForms plugin. For more details, check out how to install a WordPress plugin. From there, you’ll need to integrate your form with MailChimp using the MailChimp addon, as well as create a newsletter signup form. For a step by step tutorial, you can read how to create a MailChimp signup form in WordPress. Lastly, you’ll need to make sure you have at least one list created in your MailChimp account. For instructions, read up on how to create a MailChimp list. 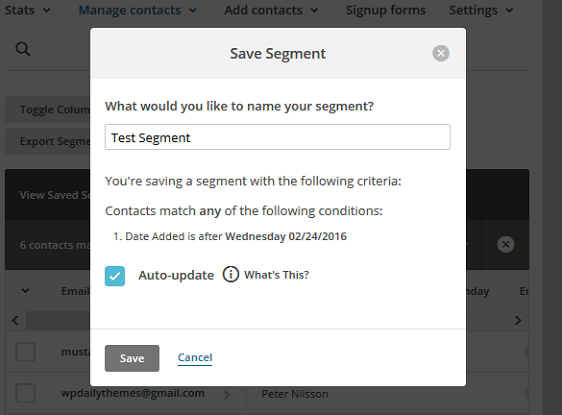 The next step is to create a segment in your MailChimp account. 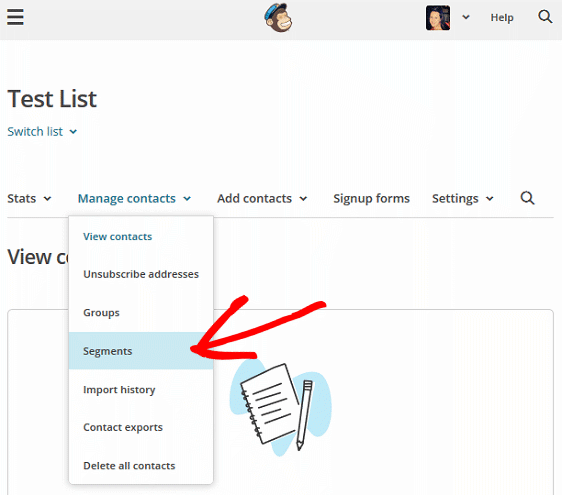 To do this, navigate to the list you want to segment, and under the Manage contacts dropdown, click on Segments. You will now see the section where you can define your conditions. Remember, you can define up to five conditions. Every condition you define must be met by a subscriber in order for them to be added to your segment. There are several pre-built segments you can choose from that are broken down into subscriber engagement, customer behavior, and demographics. You can also choose conditions such as location, signup source, and language. If you have any API 3.0 eCommerce data in your account, you can segment subscribers based on purchasing behavior. For example, you can define conditions based on whether they have purchased from you in the past, if they are a repeat customer, or have made a purchase from you in the past X days. Lastly, if you use MailChimp Pro, you can access demographic segments such as gender and age. In this example, we’ll create a simple segment. The condition will be that the subscriber must have been added to our MailChimp mailing list after a certain date. Set the dropdown menus to Date Added I is after I a specific date. Then determine a date in the interactive calendar. If you want to add another condition, click on + Add. To see which of your existing subscribers meet the conditions you have defined, click on Preview Segment. When you are happy, click on Save as Segment. In the modal popup, give your segment a name. If you want this segment to automatically update any time a new subscriber meets the conditions, click the Auto-update checkbox. You have now learned how to segment MailChimp mailing lists with WPForms. Every time someone subscribes to your newsletter form after the defined date, they will automatically be added to your mailing list segment. This is a great way to better understand your subscribers and their behavior so you can improve your email marketing campaigns. If you are looking for additional ways to target your existing email subscribers, check our tutorial on setting up a MailChimp RSS in your newsletters. And, don’t forget to follow us on Facebook and Twitter. I have a separate list for people that follow an event I do in the summer. And I post in the summer about this event. I know that some of the people on my event list are also on my main email list. My main email list is set to email whenever a new post comes out. My event list I send info to about the event…but I would like to have it also send out updates of when a post specific to the event is out. (I always put them in a specific category.) I don’t want the event list people that are also on the main list to get the same email twice, meaning, the email that an event post was posted. I was thinking I could use segments somehow to filter the people that are on both lists. Perhaps in my main list, I could segment the people that are also on the event list….I suppose I’d have to make the event list a segment of the main list if I did that. But the part I really cannot figure out is how to filter the post categories. Is there a way for Mailchimp to filter posts coming from my blog from a specific category and NOT repeat those posts to the people in the event list?? I feel like it’s not possible…that filtering categories of posts in Mailchimp isn’t possible…but I’d like to confirm so I can stop driving myself crazy trying to find out if I can or not. OR if it is possible…can you tell me how?? Your question makes total sense, however the best place to get the answer will be MailChimp’s support. Based on their help page, it looks like you should be able to avoid this by using a single mailing list with segments/groups (rather than separate lists).